Come climb the only icebergs in the Caribbean at Arawak Aqua Park. Enjoy bouncing on the giant floating trampolines, going down the water slides, riding on the rolling log, and exploring many other water toys that will keep you cool while having fun. Adults and children alike will enjoy thus wonderful time at the park. 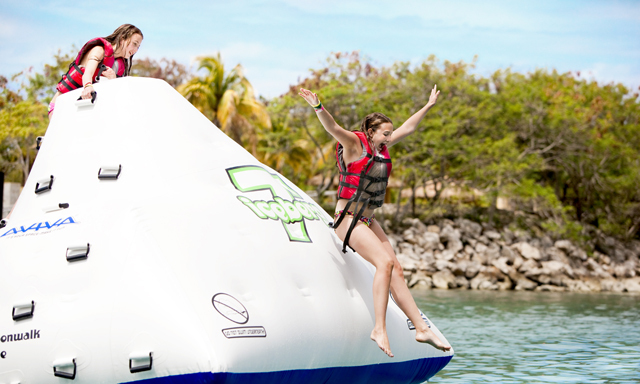 • Arawak Aqua Park: Discover and climb the only icebergs in the Caribbean and other water-park fun. • Attractions: There's something to do every minute, with icebergs to climb, in-water trampolines, slides, and kid's play area. • Scenic Location: Enjoy picture-perfect views of the turquoise sea, with lush vegetation along the shore. • Guests with cardiac conditions, asthma, diabetes, epilepsy, other heart or respiratory conditions or any other medical condition must take particular caution when selecting a tour with snorkeling/swimming elements, since such water activities could be subject to adverse sea conditions such as high winds, waves and sea current. • All guests required to wear a personal flotation device at all times. • Children under 48 inches tall must be accompanied by a parent or guardian. • Space is limited, so sign up early.